Jeremy Dutcher introduced himself in Wolastoqey, with words spoken by fewer than 100 people. The beauty of language — that it tells us "everything we need to know and how to relate to each other" — meant that when Dutcher said, "Naga Greg, Naga Mundial, Naga Jesu. Et vous," and turned softly to us, we understood. Thank you, thank you, thank you. Each musician sat in their own circle of light — Jeremy and the piano, Blanche and her cello, Greg and the drums — but their sound was anything but separate. They touched their instruments with the same humble reverence Dutcher has for his people's history, and, also like Dutcher, found new ways to interpret their shape. A violin bow glided across a cymbal. Cello strings plucked like footsteps. Dutcher's tenor quivered tenderly, utterly alive. This surging, so robust and whole, also echoed into the canyon of loss. "Just a generation ago there were entire communities" who spoke Wolastoqey, but to access ancestral recordings of the songs he'd revived and rearranged, Dutcher tapped at the glass of an iPad. "Tahoe!" he cried after two of his songs. "Tahoe!" cried a crackling ancestor after the final one. 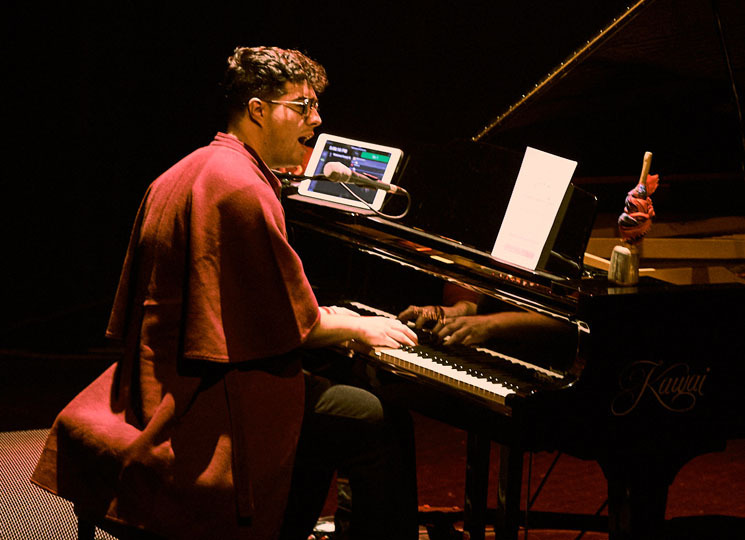 When Jeremy Dutcher slid out of his shawl, the shadows dragging across his bare arms made him look like he could be disappearing. But he wasn't. He was emerging from the great darkness, his voice a resuscitation, his being a hope, personified.